"Hello and Welcome to Byers Airport Subaru Parts Center!" Our Parts Center Has All the Genuine Subaru Parts You Need! Do you need genuine Subaru parts near New Albany, OH for minor maintenance tasks on your Subaru or for major do-it-yourself repairs? Byers Airport Subaru serving Westerville, has an extensive, well-stocked inventory of genuine pars that will fit perfectly in your Subaru. 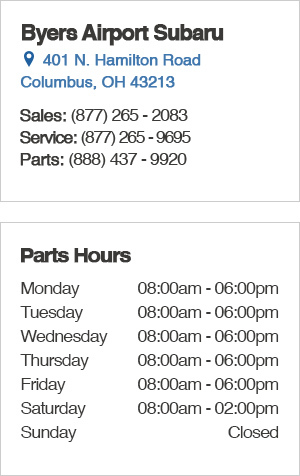 Our trained Parts Specialists will help you find the exact parts you need. If what you need is not in stock, we will find it and order it quickly. Genuine Subaru accessories near Westerville, OH are made to integrate seamlessly into your Subaru model to deliver the kind of durability and easy integration you expect from Subaru. When you want to protect your Subaru, visit our online Subaru parts store for genuine Subaru all-weather floor mats, bumper covers, hood protectors or a security system upgrade. Byers Airport Subaru is pleased to serve our local area, including New Albany and Gahanna, with award-winning Subaru models and all of the Genuine Subaru parts, chemicals and accessories a Subaru owner could need or want. The 2019 Subaru Ascent near Gahanna, OH is perfect for our Midwest weather patterns and makes more sense than ever after a heavy winter. Whether you already own a Subaru or are interested in something from our new Subaru cars near New Albany, OH we are ready to help make you a happy Subaru driver. If you can't find just what you're looking for, contact our Subaru dealership in Columbus, OH today!